Shortly after my book was first released, in 2014, I was doing a tour through Asia to give lectures on creativity at creative educations and agencies. My visit felt somewhat ironic, me explaining the Western meaning of creativity in the Eastern part of the world. Shouldn’t they be educating me about their meaning of creativity? In my book I only wrote a few paragraphs about the Eastern meaning of creativity. Recently, however, I gained some new insights on the Eastern point of view through the book The Geography of Genius. In this book writer Eric Weiner visits China – among other places – to discover its unique creative values. 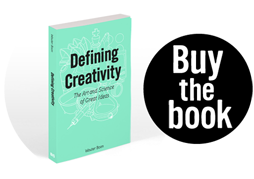 To begin with the basics – which is also what my book covers on the topic; the main difference between the Western and non-Western meaning of creativity is our focus on originality. This element is incorporated in the basic definition of creativity that we use in the Western world: to create something new, something that has never been created before. Nowadays we take this element for granted, but thousands of years ago, when our cultures were more primitive, creativity mainly focused on the skills that are required to be creative. In these times we used our craftsmanship to create identical works, not necessarily to be innovative. Creativity thus had a more rudimental meaning; it was about the simple act of creation. In many ancient and non-Western cultures creativity is thus not about diversity and change, but about continuation and harmony. For these cultures the disadvantage of revering originality – and people standing out from the crowd – is that society becomes more chaotic. Oppositely, chaos – to a certain extent – forms a fertile breeding ground for original ideas. The reason is that chaos facilitates serendipitous encounters between non-related ideas. And these kinds of encounters potentially lead to new, surprising ideas. In his book Weiner explains that an important source for the meaning of creativity in China is Confucianism, a tradition, philosophy and religion that originates from the 6th century BC, but that is still omnipresent in the Chinese culture. It is the Confucianist allegiance to tradition, authority and collectivism that have made creative continuation and harmony so important. According to Weiner, this view is well captured in the Chinese saying “The first bird to fly is the one who gets shot”. The Western philosophical alternative for the Taoist continuum is ‘creative destruction’, which is a term coined by Austrian-American economist Joseph Schumpeter (1883 – 1950). He explains innovation as “a process of industrial mutation that incessantly revolutionizes the economic structure from within, incessantly destroying the old one, incessantly creating a new one”. Schumpeter based his theory on the way Karl Marx saw capitalism, as a system that constantly accumulates and annihilates wealth. To translate this to a concrete example; creative destruction describes how digital photography could only thrive by destroying analog photography. Or, in a more contemporary example; the electric car’s success is directly related to the fossil-fuel car’s extinction. Compared to the Taoists, Schumpeter doesn’t perceive human beings merely as the cogs in the evolutionary machine – who, when lucky, discover something new – but as the machines themselves. Speaking of ‘evolution’, however, Charles Darwin, who invented (or discovered, as Confucius would have preferred) the concept of evolution, in a way also describes a system of creative destruction; in his theory species, or certain physical benefits, always do well at the expense of other species or physical benefits. What’s more, when seeing creativity as making unfamiliar combinations of familiar ideas, a parallel with Darwin is also easily made – his species constantly combine into new species and thus adapt themselves to an ever evolving world. So, you could say that the comparison between the Western and Asian meaning of creativity is that both describe it more or less as an evolutionary process. In my book I explain this concept in a similar way (paraphrasing); you need to understand the rules that have defined a creative domain (i.e. the rules made by Eliot’s dead poets) in order to break them. This means that breaking the rules without a context can only, in the best case, lead to accidental creativity. The tradition is therefore always an essential element of creativity and innovation is always built on concepts that have proved successful in the past. Ironically though, the Western, modern-day gatekeepers are not that different. Even though they will probably not admit it, most of them are quite traditional too when it comes to allowing new inventions, theories and works to enter and alter a creative domain. If an idea is too radical, the gatekeepers will easily reject it. In fact, as I describe in my book, experts are conservative by nature, since they have acquired so much knowledge about their creative domain that it’s hard for them to think beyond the rules they’ve adopted so deeply. Although China in many aspects is a country that leans heavily on tradition, it is also known for its man-made revolutions. And this is where the hierarchical, top-down way of governing and the collectivist culture comes in play. When a Chinese business or political leader decides things must change, things can and will change rapidly. Oppositely, in the Western world the democratic process can easily slow things down. Take the investments in green energy. In a very short time China is changing from the quintessential C02-polluter (we’ve all seen the images of Beijing covered in smog) into a heavy investor in green energy; in 2015 the country invested $103 billion in renewable energy, ahead of Europe with $49 billion and the United States with $44.1 billion. And China has another big goal: In 2014, Xi Jinping, China’s president, called for a robot revolution that will make China the largest producer of robots – replacing human workers in factories, agriculture and other places. The openness to change is also something I sensed in the people, when I visited Shanghai in 2014. Many people told me that the Chinese are looking at the future with the attitude that today is better than yesterday and that tomorrow will always be better than today. Another element that helps the Chinese to adapt quickly to a changing environment – or cause the environment to change, you might as well say – is that they master reversed engineering; they take a state of the art example, take it apart and improve it. So, while the Western creative process can be an inefficient process that slowly and serendipitously explores its course, Chinese innovation nowadays is often much more efficient. In that sense the relative indifference to originality can paradoxically actually accelerate the process of innovation. At the same time this means that the Taoist, evolutionary point of view in China slowly recedes to the background. So, to summarize things; apart from the fact that originality is less important – and less appreciated – in most Asian cultures, the things that both the Western and Eastern meaning of creativity have in common is that the creative process is both evolutionary and revolutionary. Evolutionary because new ideas are always built on existing ideas and because the value of these new ideas is always judged by looking at the past – as much as into the future. And revolutionary, because innovations often make old technologies or products obsolete. Both in the Eastern and Western world innovation is thus an organic, evolutionary process that is being constantly and quite randomly slowed down by conservative forces on the one hand and accelerated by revolutionary visions and executions on the other. Which means that creativity in the East and West largely comes down to the same thing. This reminds me of a quote of the contemporary Chinese artist Ai WeiWei: “The world is a sphere, there is no East or West.” It’s ironic that I am reminded of WeiWei, since with his independent, critical voice and unique and provocative art – often criticizing the Chinese government – he is the grand exception to the Confucianist rule that creativity should be centered on continuation and harmony, rather than originality. In one of his more famous works, ‘Dropping a Han Dynasty Urn’ – depicted above this article – Ai WeiWei drops a 2000-year-old urn to addresses the Chinese government’s role in destroying the country’s cultural heritage to make way for new development. The work therefore beautifully both directly and indirectly communicates the meaning of creative destruction.